The book locates the professional in the political context before outlining the key challenges faced and experienced, and laying the foundations necessary for the professional to thrive. An expert team of contributors analyses the differences between professionalism and 'professionalisation', and emphasises the importance of promoting a collaborative, sharing culture to give you the knowledge needed to challenge and contest competing agendas. Topics covered include:understanding the impact of policy upon teachers and the teaching profession;developing a professional identity as a teacher;building resilience and a sense of wellbeing as a teacher;building and sustaining creativity in the curriculum;safeguarding young people;examining the impact of globalisation on educational practices. 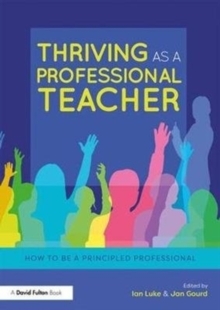 With case studies, opportunities for reflection and clear chapter summaries woven throughout, Thriving as a Professional Teacher will help you to form a sustainable identity and to create a teaching and learning environment in which both teachers and students can thrive. It is an essential read for both trainee and practising teachers.